Is your furnace ready for winter? Do you want to lower your heating costs this season? Having furnace maintenance in Greensboro NC performed by the expert HVAC technicians at Berico this fall season will get your furnace running efficiently before winter and lower your heating costs. If you’ve never had maintenance on your furnace, it is likely way overdue. Why does my furnace need regular maintenance? A furnace, much like a car, requires periodic service to run smoothly. Furnaces get dirty, parts wear out, lubricants dry up, and electrical wiring corrodes. These are just a few of the reasons your furnace needs regular tune-ups. How often does my furnace need maintenance? HVAC (heating, ventilation, and air conditioning) technicians recommend scheduling a tune-up every year. A long winter of constant running and a summer of sitting dormant takes its toll on your furnace. What does maintaining my furnace entail? Typical furnace maintenance includes inspecting, cleaning, lubricating, and replacing the various parts of your furnace. Inspection reveals any worn out parts or areas of concern. Worn out parts will be replaced and any loose parts will be tightened up. Moving parts will be lubricated to prevent future wear. Dirt, dust, and soot that build up in your furnace will be cleaned out. Electrical connections and voltages are checked. Filters are replaced. When should I schedule an appointment for maintenance? The best time to schedule furnace maintenance is late summer or early fall. You want your maintenance completed well before the cool weather sets in so that your furnace will be ready as soon as you need it. And in late summer and early fall, technicians are less busy and scheduling is more flexible. 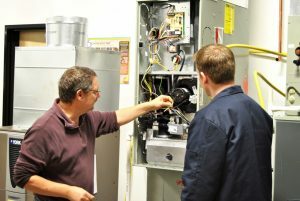 What are the benefits of furnace maintenance? One of the biggest benefits of furnace maintenance is energy savings. When your furnace is well maintained and running properly, it uses less energy, which saves you money each month throughout the heating season. Another benefit is the peace of mind you will have knowing that your furnace is in good shape and will work reliably to keep you and your family warm through the cold winter days and nights. To schedule furnace maintenance in Greensboro, call Berico at (336) 496-1447. Autumn Leaves Are Falling, Be Sure to Maintain your Furnace Is Your Furnace Ready for Winter?